Bob Jane T-Marts is an independent, family-owned business that’s been operating since 1965. They specialise in selling tyres, wheels and a range of services such as wheel balancing, wheel alignment and puncture repairs. 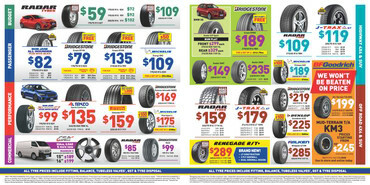 Shop online at Bob Jane T-Marts to browse the latest weekly ads and catalogues for hot deals and special offers. No idea what to buy your loved one for that special occasion? Why not give them a Bob Jane T-Marts Gift Card! Simply select a denomination between $20 and $4999 and add a greeting card with a personal message! Gift Cards are sent by email, Standard Post, Express Post or Registered Post for a small fee. 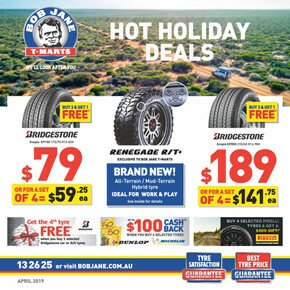 Bob Jane T-Marts are committed to giving you the biggest range of tyres from the best brands in the business at the lowest prices possible. If you find an identical stocked tyre for less at another retailer, Bob Jane T-Marts will match the price and pay you 10% of the difference! For up-to-date information on store locations, trading hours, and to browse the latest Bob Jane T-Marts flyer, visit the Shopfully website and app today!